Designed by Kelly Johnson and the famed Lockheed Skunk Works in the early 1950s, the F-104 was introduced to the world as "the missile with a man in it." The striking Lockheed F-104 Starfighter was unlike anything the world had ever seen and promised to be an ultimate interceptor that was small, light in weight and had stunning straight-line performance. 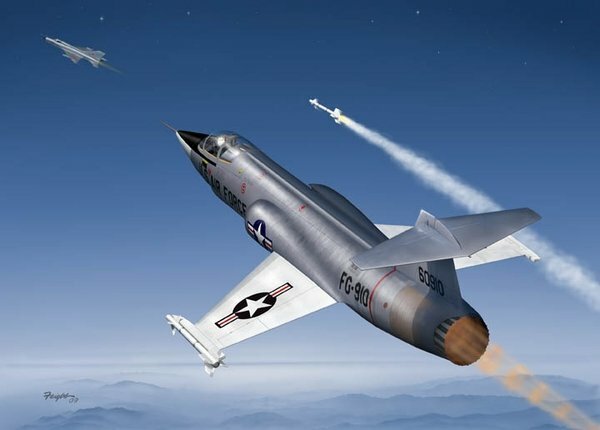 The prototype first flew in 1954 and went supersonic only eight years after the X-1 first broke the sound barrier, but it was four years before the F-104A was operational. The early 104s were easily the hottest aircraft around and in 1958 specially prepared Starfighters set new world speed and altitude records of 1,400 mph and 91,250 feet. The F-104 was never agile enough to become what its designers wanted but it did evolve into a sophisticated all-weather ground attack aircraft. There were 2,439 F-104s built in eight countries between 1954 and 1979.